Wood-burning fires contained in a commercially manufactured portable fireplace, that is equipped with a screen or door, lid or spark arrestor, and is above the ground. Chiminea types do not meet these requirements. See Guidelines for Portable Outdoor Fireplaces. Cooking fires using natural gas, propane, or charcoal, contained in commercially manufactured barbeque or cooking appliance. Permanently installed fire pit, fireplace, barbeque, or cooking appliance for which building permits are issued at the time of construction. - Building permits are only issued for fire pits using natural gas or propane. Permanently installed and permitted fire pits are not designed for wood burning. Permanent barbeques and portable fireplaces shall not be used for the disposal of stumps, rubbish, trash, or combustible waste material. Pit barbeques are allowed upon completion and approval of a "Miscellaneous Burn Permit" on a case-by-case basis following an on-site inspection. Miscellaneous Burn Permits are not issued on the 4th of July, Thanksgiving, Christmas or New Year's Eve/Day. At the time of application, a $100.00 fee is due. The Air Pollution Control District (APCD) allows agricultural burning permits to be issued during certain times of the year, within specific limits. The APCD permit is required to be completed by the applicant and submitted to the Escondido Fire Department. APCD Permit form must be obtained from the Fire Department Headquarters. Permits are issued only when the weather allows - never during "Fire Season". Only "Agricultural Material" which is a direct result of agricultural operation (citrus, avocado, macadamia, flowers, trimmings, etc.) or other vegetation cleared from groves may be burned. Only natural vegetation and trimmings are allowed to be burned. No man-made materials such as processed lumber are allowed to be burned. Burning trash is prohibited. No green material is allowed to be burned. Vegetation and trimmings 1" or less in diameter must be dried a minimum of 30-days prior to burning. Vegetation and trimmings of 1" to 4" in diameter must be dried a minimum of 90-days. No branches or tree stumps 4" or larger in diameter shall be burned. Brush that has been cleared for development does not meet burn requirements and is prohibited from being burned. Maximum burn pile size is 10' x 10' x 10'. Minimum of 30' clearance around the pile. Pile is to be on bare dirt and located a minimum of 50' away from any structure. An adult 18 years of age or older must be in attendance at all times while the pile is burning. Only one burn pile permitted; other debris must be fed into the main pile. Pressurized water supply must reach around the entire burn pile. Permission to burn must be obtained the day of the burn by calling the phone number listed on the permit. 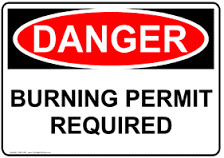 Burn Permits are issued for a two-week period and may be extended over the phone for up to one (1) week at a time, for a total of two (2) weeks. Obtain and complete application at Fire Administration, a $100.00 fee is due. 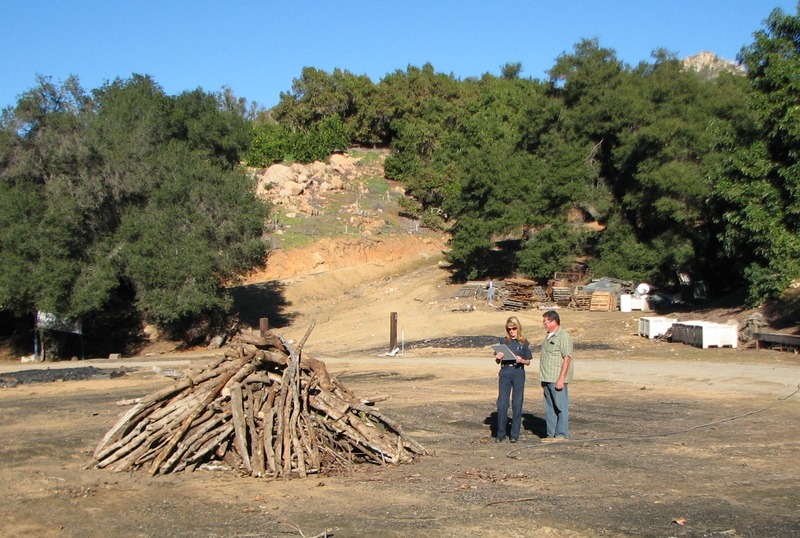 Schedule an on-site inspection by Escondido Fire Department personnel.